Choose your label stock size and type from the table below and then click on the Primera part number to order and for more information. 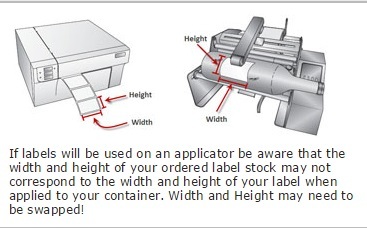 Note that label sizes are width by height as they come out of the printer, as per the below image. Not sure about the label stocks? All label stock listed below is Primera official label stock so you know it is optimised to work with your Primera printer. Want to know more about the different types of labels we offer? Click the button below to view more information on the different label types and compare the properties of each. We recommend that all label stock should be thoroughly tested under end-use conditions to ensure it meets the requirements of the specific application. Before ordering, please request a sample via the "Get Sample Label Pack" button below if you have any doubt about suitability. We recommend testing especially if you plan to use any type of label stock in or near water or under direct sunlight. Just want to see a sample of the different types? No problem, request a sample pack. Don't see the size you want? We can make it for you! S=Shape. C = Circle. SQ = Square. Unless stated otherwise under the shape column, all labels include a .125" corner radius. Some labels are perforated and others are non-perforated. Please check the product page for more details or check with us. Perforation allows you to easily separate labels or fanfold them.